I ride my bike 28 miles (45 km) to the top of Mt. 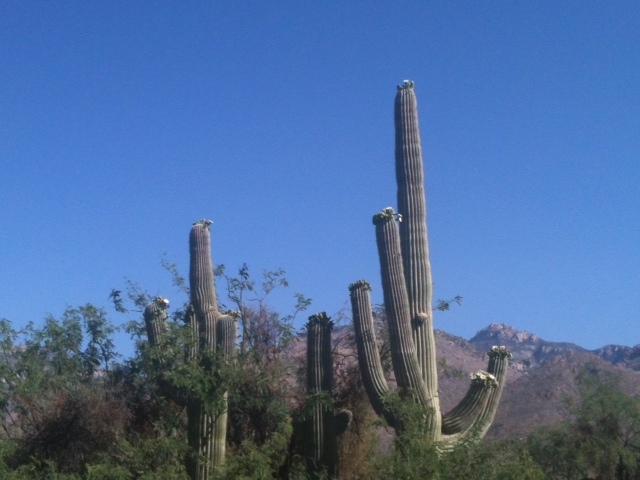 Lemmon, near Tucson, Arizona. It’s a big climb, starting at an elevation of 2605 feet, ending at 8,077 feet (794 to 2462 meters). But the road isn’t the biggest part of the Catalina Mountains. On a recent visit to my hometown, I convinced my buddy Lee to join in the Greater Arizona Bicycle Association Mt. Lemmon hill climb with me. For me, the main benefit of being on a supported ride are snacks and drinks at the aid stations. The Mt. Lemmon Highway runs through the Coronado National Forest with no public water sources until about mile 20. It’s a very popular cycling route. In the winter, professional cyclists and triathletes ride up and down the usually sunny Mt. Lemmon for winter base training miles. Our ride day dawns cold, unusual for May, and it gets colder as we climb up the mountain. (The next day, snow falls on the upper ridges). We snake our way up the mountains, first on south slopes overlooking the city, then we follow the road inside the mountains and switch-back along an interior canyon. Beyond the guardrail, the gaping canyon is so deep that we can’t see the stream that created it. Looking west across the canyon, more ridges, more slopes, more canyons ripple the topography. Ridges end at peaks un-named and named: Thimble Peak, The Castle, Finger Rock. Some folds of this earth are inaccessible by road or trail, even rock climbers cannot reach the cliffs. The Catalina Mountains mark the northern horizon of Tucson, but its many dimensions must be seen from within the range itself—deep and wide. From our bike saddles, we also see the Rincon Mountain range on the eastern horizon of Tucson. In the Rincons, hills roll into multiple ridges topping out at two peaks. We climb higher through several biomes with their unique signature plants. We start in the Sonoran Desert with rocky slopes of Saguaro cacti and agave, then reach the oak woodland at about mile 6, and 5,000 feet. Next we ride through conifer forests and towering Ponderosa pine trees. Reports of “rain at the next aid station” doesn’t deter us because we have great wind/rain jackets. I rarely put on a jacket after miles of uphill climbing, but this time I do. I wish I had jackets for my frozen toes. Clouds block our view of the uppermost peaks, and fog descends onto the road. Fortunately, the rain holds off. Unfortunately, it’s so cold, some cyclists battle hypothermia and crowd into vans to be driven down the mountain. We ride past giant “hoo-doos,” rock formations sculpted by wind and water. For our sweet and salty fix, we eat pie and peanuts at the final aid station, seeking shelter from the wind behind skinny trees. Lee keeps talking about chili at the Iron Door Restaurant, located at the Mt. Lemmon’s Ski Valley. We pass aspen groves, descending and climbing again. We stand in our pedals to conquer the final section with its 11 percent grade. Riding in the mountains makes me dream big. At our fireside lunch (yes it’s cold enough to have a blazing fire in the hearth), I propose a four-peak expedition to Lee. We will bike into the four mountain ranges that surround Tucson, then hike to the highest peak. We discuss various options, the best bikes to use, and different approaches to the peaks. As we demolish his bowl of chili and and my bowl of split pea soup, the sun breaks through the clouds. Our descent starts cold, then we warm enough to remove hats and jackets. We scream 28 miles down the beautiful curves of the highway, battling wind gusts, and coast into the Tucson valley and home. What is your “big country” beyond the lines you run or bike on roads and trails? May you dream big during your next bike ride. Except when it snows, Mt. Lemmon Highway (also called Catalina Highway or General Hitchcock Highway) is open to cycling all year. Info here: http://goo.gl/iIrDBp . I live in Tucson and am incredibly impressed by the cyclists that ride up (and down!) Mt. Lemmon. Great work!